Access is a curb-to-curb shared-ride service. Several riders will be transported at one time in the same vehicle. It is not cab service, emergency medical or social service transportation, and is not door-to-door or a private transportation service. 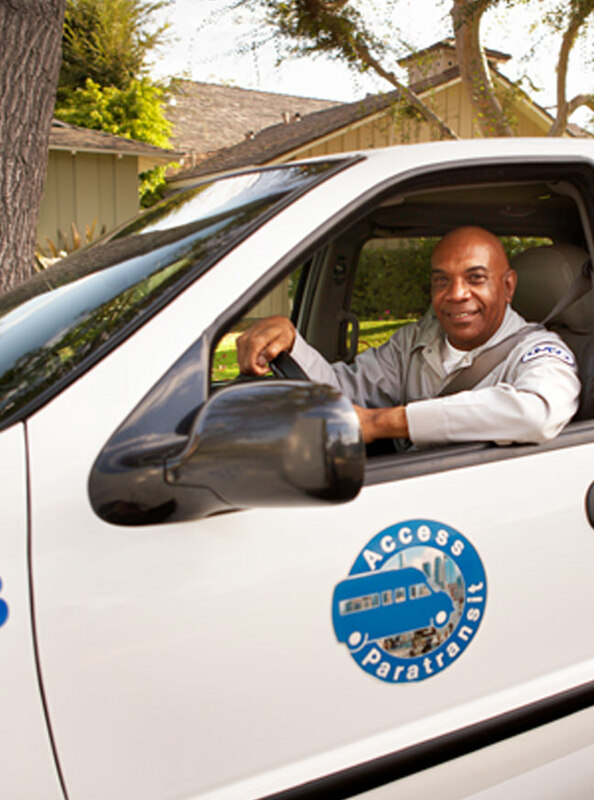 Access provides service within ¾ mile of fixed-route bus and rail line in Los Angeles County. Access operates on the same schedule as most buses. Regular service is offered from 4:00 AM to 12:00 AM, 7 DAYS A WEEK. Limited service is available from 12:00 AM to 4:00 AM. As a shared ride service your travel time will be similar to that of a fixed-route bus, not a car or taxi. Your one-way fare is based on the distance you travel with a maximum fare of $3.50 (except to/from and in Antelope and Santa Clarita Valleys). IMPORTANT: Access may not be able to transport a wheelchair or mobility device larger than 30” wide and 48” long and weighing more than 600 lbs when occupied.